The mere thought of walking down the war-torn streets of Iraq with an automatic weapon in hand in anticipation of coming under fire is enough to get the adrenaline flowing through the veins of most people. When it comes to Wood River Valley native Rob McQueen, for whom this is just part of the daily routine, it takes a truly momentous moment to get his blood racing. "I had never been so nervous and excited before," said McQueen, a first lieutenant in the U.S. Army serving in a rural area south of the Baghdad International Airport. While one would guess that the 26-year-old was referring to his deployment to Iraq last September, McQueen was in fact describing the moment he stepped off the airplane in Hailey in early May to meet his daughter, Devlin, for the first time. Since she was born during the first half of his tour, McQueen had yet to see his 3-month-old in the flesh, but the wait proved little hindrance to their relationship. "You could tell right away there's a special bond between the two," said Tiffany McQueen, Rob's wife of a year and a half. For McQueen, who was commissioned as a second lieutenant in 2006 after two years in the National Guard and graduating from the University of Idaho's Reserve Officers' Training Program, this sacrifice provides a mere inkling of the mental fortitude required of soldiers stationed overseas. "It's hard to leave family no matter what the circumstances, but it was definitely harder knowing what I was going to miss," said McQueen, whose parents, Mark and Polly, still live in Indian Creek, north of Hailey, where Rob was raised. "Going over, you can't afford to think about the danger aspect. You just focus on doing your job." If McQueen's title is any indication, his job offers little opportunity to focus elsewhere. 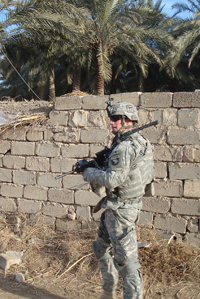 As an Air Assault Light Infantry Dismounted Reconnaissance Platoon leader, McQueen is in charge of a 25-man group tasked with "reconnaissance, surveillance and target acquisition," work that requires extensive interaction with the Sons of Iraq, a local Sunni force McQueen likened to a border patrol. "We're lucky that we control the area in which we operate," McQueen said. "We do a lot of counterinsurgency—finding weapons caches and IEDs (improvised explosive devices). However, I've been fortunate to have never been in a fully engaged firefight, although we do get pop shots." This last statement comes with a nonchalant acceptance that would probably be difficult for the average Wood River Valley job holder to comprehend. The fact that McQueen is considered old for a platoon leader, a position usually filled by 22-year olds, is also remarkable. "I have 18-year-olds taking on way more responsibility than most people in their 30s," said McQueen. A graduate of Wood River High School, McQueen spent 11 months training in Fort Knox, Ky., and Fort Benning, Ga., to become a tactical expert. Sitting in quiet downtown Ketchum with a snow-dappled Bald Mountain behind him, McQueen scrolled through pictures on his laptop that further highlighted the vast incongruity between his chosen profession and life in the Wood River Valley. Here he is lying in a bombed-out concrete building, his eyes glued to a spotting scope, a sniper at his side, surveying the dusty, barren landscape below for potential targets. Now he's standing in front of a tarpaulin covered with rifles, ammunition and explosives recovered from a hidden hole in the floor of a small shack. But out of all the shots that illustrate the combat-oriented aspect of his mission, it's a seemingly nondescript picture of a group of Iraqis at work in an industrial building that causes McQueen to pause. He identifies it as a water treatment plant, one of the many projects aimed at improving economic and community development. "We do a lot more helping than people think—it's actually mostly what we do," McQueen said. "The people we deal with want us there, especially after they see the positive impacts and that we're not there just to blow stuff up." In fact, the majority of McQueen's photographs show some sort of interaction with locals in his patrol area, whether it be conversing with sheiks—the tribal leaders who act as mediators between the U.S. military and the residents—or posing with groups of smiling children. "The kids love us—they just want soccer balls and pencils," McQueen said, noting that their adolescence is markedly different from his own. "It's amazing—they just go about their lives even though guys are walking around with guns." Not surprisingly, with only 18 days of leave allowed during his 15-month tour, McQueen is unable to get his mind completely away from the troops under his command. "I don't really want to leave my wife and kid, but I'm excited to get back. I think of my platoon as family as well," said McQueen, who returned to Iraq in mid-May. "It's weird being home and thinking about the soldiers every day, but I've been keeping in touch with them and don't have to worry about their safety." McQueen attributes that sentiment to the quality and experience of his non-commissioned officers, some of whom have been in Iraq for more than one deployment. Their input is sought when planning missions and helping with the unceasing schedule in which his platoon members patrol six out of seven days, covering 10 to 15 kilometers if on foot or 40 to 50 kilometers when traveling in vehicles. Before heading back, McQueen took time to stop by the office of ESS, a Ketchum-based company that provides protective eyewear to military, law enforcement and emergency services personnel, where he weighed in on a marketing brainstorming session for an ad to run in Stars and Stripes, the famous U.S. military newspaper. As a demonstration of gratitude for what the homegrown soldier is doing abroad, McQueen came away with a bag full of goggles and sunglasses to take back to his platoon. McQueen is uncertain for how long he'll get to put the new hardware to use, as he is overdue to be rotated out of the field into an executive officer position that would see him frequently behind a desk, a prospect he regards with something less than enthusiasm. With his commitment to the Army until at least 2012 and plans to apply for Special Forces selection, it's possible that it will be some time before McQueen can play with Tiffany and Devlin without a sense of urgency. However, McQueen said that there is one certainty in his future. "I owe it to Tiffany to be back for the next child."